“Take a wreath. Face a tomb as you walk towards it. Place a wreath at the tombstone. Back away two steps with your face facing the marker. 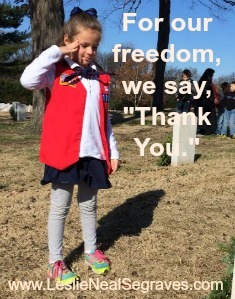 Salute for a few seconds of silence.” My six year old participated in laying wreaths at the tombs at the National Cemetery in our city with her American Heritage troop in December. I watched these little girls learn to show respect, honor and appreciation to those who lived before them and sacrificed so these little ones could experience freedom. (I may not have given the instructions exactly as they were given, but the girls were taught to lay wreaths with respect for the fallen). I recently read the book Ashley’s War: The Untold Story of a Team of Women Soldiers on the Special Ops Battlefield by Gayle Tzemach Lemmon. My respect for the military grew even more as I read how people live and sacrifice to defend our freedoms and serve others. I thank my family members who have served in various branches of the military – my dad (Alan Neal), my granddads (Murrell Neal – with Jesus now!) and Thomas Dockery (still living and one of my dear friends! ), as well as great uncles and uncles like Dennis Neal and David Dockery and cousins like Wade Breeden. I think one of my regrets of life is that I did not serve a term for my country. After traveling so many places in the world, I realize that what has been won for Americans – namely freedom – is truly a special gift. And yet like President Ronald Reagan said, “Freedom is never more than one generation away from extinction.” I see the unraveling of our nation at such amazing speed in so many areas. As Reagan said at the end of one speech , if we don’t defend freedom (and take it for granted), we may simply be explaining to our children and grandchildren what America once was. By God’s grace, I’ve been traveling to serve humanity in a different army since I was 18. I realize every time I grab my passport and place it in my shoulder bag (and now a stack as we have three kids who travel with us – still working on one child’s American passport!) that I can thank the American military – past and present. I can easily travel to multiple nations to share Jesus’ hope and light with broken humanity because of freedoms won by past military and protected by current military. The freedom to travel is but one of many freedoms we have in the U.S.A. So today as I look at our passports and see stamps of visas from multiple nations, I declare THANK YOU to our troops – both past and present. Because of your sacrifices, one of the freedoms I experience is a passport filled with stamps because your sacrifice has made travel for me not only easier but more possible. Yes, our family will do something fun together today. But today I will also gather my children and explain the meaning of Memorial Day. Heeding President Reagan’s words, I don’t want my children to take others’ sacrifices for granted- as if they are entitled to them. And if we allow the day to go by without remembering those who serve, my children’s hearts will yes, grow greedier. 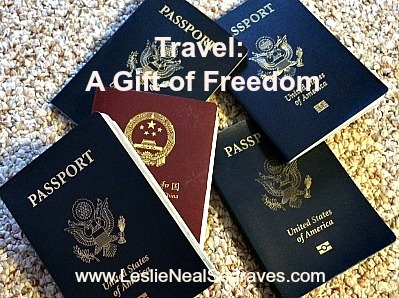 The freedom to travel will be one gift our family has received from others’ sacrifice. And because of these passports, we have the blessing and the responsibility to travel proclaiming that Jesus Christ can make us all truly free – both now and for eternity!